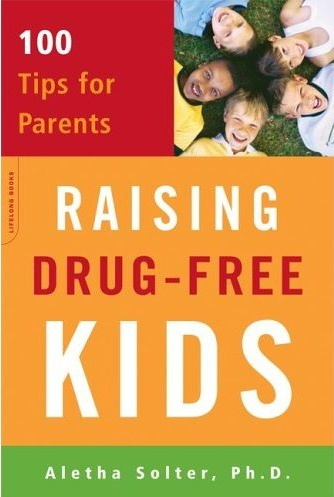 Raising Drug-Free Kids by Aletha Solter, Ph.D. Copyright © 2011 by Aletha Solter. All rights reserved. No part of this article may be reproduced or transmitted in any form or by any means, electronic or mechanical (including copying to other web sites, and including translations), without written permission from Aletha Solter, with the exception of printing copies for personal use and for free distribution to parents. Numerous researchers have investigated the relationship between parenting practices and later drug use by children. Studies have shown conclusively that the home environment is the most influential factor in determining whether or not kids will get hooked on drugs. While this finding may be reassuring to parents who fear outside influences on their children, it can also cause anxiety by placing a huge responsibility on parents' shoulders. Many parents wonder what the most important factors are. Should they set firm limits and consequences? How involved should they be in their children's lives? What should they tell their children about drugs? There are five basic principles to keep in mind for raising drug-free children: 1) Spend time with your children, 2) Use a democratic approach to discipline, 3) Accept your children's emotions, 4) Be a good role model, and 5) Give your children age-appropriate information. A major finding that has emerged from research studies is that the root cause of most behavioral problems, including substance abuse, is not a lack of discipline, but rather a lack of connection. Children who lack a close relationship with at least one loving parent are at risk for substance abuse, no matter how much discipline you impose on them. An interesting study with monkeys found that those who were deprived of their mothers during infancy drank more alcohol as adults than those who were raised with their mothers from birth. The implication for humans is that attachment parenting, with close physical contact between parents and infants, may be especially important in establishing later alcohol resistance. Toddlers continue to need closeness and attention. It is normal for your young child to resist being left alone at bedtime, miss you when you are gone, and want you nearby when she is ill or frightened. It is important to meet your child's legitimate needs for closeness and comfort. Don't worry about "spoiling" your children. During the middle childhood years, your children may want to spend increasingly more time with their peers. However, your children still need you to be involved in their lives. Even during the teen years, your involvement and interest continue to be vitally important. In a study called the National Longitudinal Study on Adolescent Health, researchers interviewed twelve thousand adolescents in their homes periodically from the ages of 12 to 18 years. Adolescents who felt more connected to their families and schools were less likely to use drugs, be depressed, or be sexually active at an early age. To stay connected with your children during the teen years, you can volunteer at their school or do activities together as a family, such as music, games, sports, or creative projects. Be sure to honor your family traditions, no matter how old your children are. Try to eat meals together several times a week. Be available to talk with your children, and don't forget the importance of listening non-judgmentally to them. There is a widespread belief that children who become involved with drugs lack discipline, and that the parents have been too permissive. This belief can be a source of anxiety for parents who practice gentle discipline. The research is reassuringly clear on this subject. Numerous studies have found that adolescents who abuse drugs are more likely to have parents who use strict, authoritarian discipline with punitive consequences. These children turn to drugs as a way to rebel against their parents and cope with the stress of living in a punitive home. When children are raised with non-punitive discipline, they don't have anything to rebel against. It can be challenging to avoid the pitfalls of authoritarian discipline if you grew up in a strict authoritarian home, because you lacked role models for non-punitive discipline. It is important to begin with a non-punitive approach right from the start. Researchers have found that children whose parents used verbal reasoning rather than punitive consequences when the children were five years old were less likely to be involved with any of the "gateway" drugs ((obacco, alcohol, or marijuana) by age twelve. If your willful toddler says "No!" when you tell him that it's time to leave a playground, keep in mind that you want him to say no to drugs when he is older. It is unlikely that he will have the courage to resist his peers later on if you punish him for resisting you when he is two years old. Your toddler doesn't like to feel controlled, so the key to eliciting cooperation is to win him over to your side. Three ways to accomplish this are to turn the activity into a game, give your child choices, and explain the reason why you need his compliance. If you can visualize your toddler as a teenager with the courage to say "no" to drugs, it will be easier to think of creative, non-authoritarian ways to win his cooperation. Discipline with older children and teenagers can be even more of a challenge, but if you try to change your children's behavior with punitive consequences (such as grounding them, confiscating their electronic devices, or requiring extra chores), your children may become resentful and rebellious. Furthermore, neither punishments nor rewards can provide children with the correct kind of motivation. The important question to ask yourself is "What do I want my children’s motivation to be for their behavior?" Do you want your children to stay away from drugs only because they are fearful of your punishment? Or because they respect their bodies, value the information you have given them, and have no need to numb painful emotions? Family meetings can be a helpful first step in switching to a democratic approach to discipline. The effectiveness of discussions and joint decision-making is based on the well-established psychological principle that children are usually willing to follow rules that they themselves have helped create. In a family meeting, everybody can bring up a problem, participate in finding a solution, and make rules. With a democratic approach to discipline, you will create an atmosphere of respect and trust, and your teen will have nothing to rebel against. We all have a certain amount of emotional "baggage" from the past, especially if we experienced early trauma. This emotional baggage consists of an accumulation of painful emotions that have never been expressed or released, including grief, terror, anger, resentment, and confusion. This unhealed trauma can be a major factor contributing to later substance abuse because people consume mind-altering substances in an effort to numb their painful emotions. Effective recovery programs provide a supportive environment for addicts to accept and express these repressed emotions by talking and crying. It is possible to raise children so they will not have any emotional baggage. Children know instinctively how to heal from stress and trauma, and they do so primarily by crying and raging. It is therefore extremely important to allow your children to express their emotions while they are growing up. It is never helpful to tell a child to stop crying. Unfortunately, many parenting books lead parents to believe that crying and tantrums should be ignored or punished because children are simply being "manipulative" We sometimes fail to recognize the amount of stress in children's lives, and we forget that there is always a valid reason for their tears, fears, and tantrums. The more we repress our children's emotions or distract them from crying, the more likely they will be to seek relief through drugs later on. No child of any age should ever be ignored when she cries, so don't leave your baby to cry alone. When your child has a temper tantrum, try to stay connected and loving while letting the outburst run its course, even if you think that she is "over-reacting". It is especially important to accept your child's emotions if she has experienced personal trauma, such as a serious illness or sexual abuse, or if your family has lived through a natural disaster, divorce, death, or financial crisis. Be alert for signs of stress, anxiety, or depression in your children, and don't assume that time will heal all wounds. If necessary, look for a competent psychotherapist to help your family through difficult times. Allowing your children to express themselves freely and heal from stress or trauma is one of the most important steps you can take to strengthen their resistance to drugs. If you are addicted to alcohol or drugs (including prescription medicine), it would be both hypocritical and unrealistic for you to expect your children to stay away from drugs. Find a treatment program for yourself, try to surround yourself with people who are sober and drug free, and learn healthy ways to cope with stress. If you are drug free but your partner abuses drugs, find support for yourself as you learn how to convince your partner to seek treatment. It is helpful to model the values that you want your children to adopt. If you want them to respect laws, obey the laws yourself. If you want your children to respect their bodies, put wholesome substances into your own body. Another way of being a good role model is to avoid giving drugs or alcohol directly to your children, beginning at conception. Even small sips of alcohol can be risky for a child who has inherited a genetic predisposition to alcoholism. If your child shows signs of hyperactivity or mood swings, look for alternatives to psychiatric medication. Prescription stimulants and antidepressants can be dangerous for children. Furthermore, Ritalin (often prescribed for hyperactivity) is frequently abused by teenagers in the United States. If you are the child of an alcoholic, you may find it difficult to be the kind of parent you want to be because you lacked good role models. Look for a support group for adult children of alcoholics, and seek other parents who are struggling with the same issues that you are facing. You can begin to teach your children the difference between poison, medicine, and food when they are about three years old. As they grow older, let them know that everything we eat or inhale ends up in our blood and goes to our brain. Certain substances can affect our thoughts and mood, and these can be dangerous, even though we might sometimes need them for medical reasons. Many children have the impression that prescription medications and over-the-counter drugs are safer than illegal drugs, so be sure to correct this misconception. Tell your children that certain kinds of medicine can be addictive and dangerous. Teach your children early on about the dangers of inhalants. Some children start using these dangerous substances during the elementary school years because they think it's fun. Keep potential inhalants (such as glue, hair spray, nail polish remover, or gasoline) out of your children's reach and tell them that the fumes can be deadly. When your children are eight or nine years old, give them more specific information about tobacco, alcohol, and illegal drugs. Look for age-appropriate books at your local public library, and answer your children's questions. When your children reach the teen years, the best way to convey information about drugs and alcohol is through "teachable moments". For example, if a car accident was caused by someone driving under the influence, mention it to your teen and invite an exchange of feelings. Another effective approach is to role play real or imaginary scenarios and invite your teens to practice saying "no" to their peers. Remember to keep it fun! Be sure that your teens understand the phenomena of addiction, tolerance, and withdrawal, and let them know that it is more risky to use alcohol or drugs when the brain has not yet finished growing. Remind them that brain growth is rapid during the adolescent years. There is no need to hide your family's secrets. If you have relatives who were addicted to alcohol or drugs, you can tell your children about their struggles. If you feel comfortable doing so, you can also share your own past experiences with drugs or alcohol. In addition to these five basic principles, be sure to inform yourself about the various symptoms indicating drug use. If you suspect that your child has become involved with drugs, you will then know exactly what to look for. Sometimes, in spite of our best efforts, our children do not turn out the way we had hoped. If your child begins to experiment with drugs, remember that you have done your best and that you are not the only influence in his life. Try to find a loving and supportive way to discuss your child's drug use with him and to express your concerns in a non-confrontational manner. Keep the communication open. If you think that your child has become addicted to drugs, inform yourself about intervention and treatment options. Look for information and support from books, substance abuse counselors, medical professionals, online forums, and other parents who are struggling with similar problems. If you feel guilty because your child's substance abuse is caused partly by your own past mistakes, don't be too hard on yourself and don't despair. Realize that you can always be part of the solution, even if your child needs professional treatment to become drug free. Above all, don't ever give up. Think of your child as the innocent baby he once was, and keep striving for ways to establish a close, meaningful connection with him. For a complete description of preventive parenting (from birth to age 25), see Aletha Solter's book, Raising Drug-Free Kids. This page was last updated on February 21, 2018. Copyright © 2011 to 2018 by Aletha Solter. All rights reserved. No part of this article may be reproduced or transmitted in any form or by any means, electronic or mechanical (including copying to other web sites, and including translations), without written permission from Aletha Solter, with the exception of printing copies for personal use and for free distribution to parents. Warning/Disclaimer: The information in this article is not intended to be used as a substitute for professional advice or treatment. When children display emotional, behavioral, or medical problems of any kind, or are addicted to chemical substances, parents are strongly advised to seek professional advice and treatment. Some of the suggestions in this article may be inappropriate for children suffering from certain emotional, behavioral, or physical problems. Aletha Solter and The Aware Parenting Institute shall have neither liability nor responsibility to any person or entity with respect to any damage caused, or alleged to be caused, directly or indirectly by the information contained in this article.